Old Nice 3 bed apartment overlooking Place Massena, beach 70 yards. 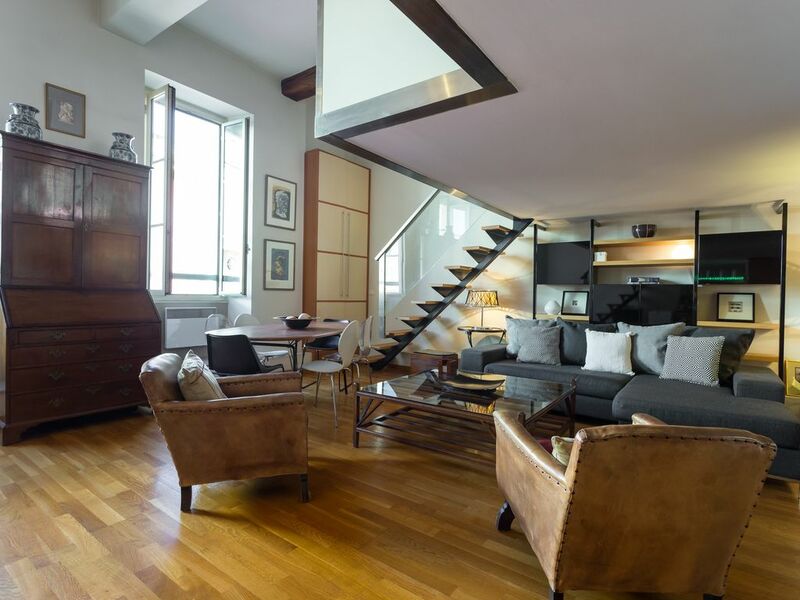 Modern apartment right in the heart of Nice being perfectly situated. The apartment building is 18th century and forms part of the centre architectural and cultural centre piece of Nice with the famous archway red buildings, open pedestrian plazza lined with shops and restaurants, modern and ornate classical fountains with beautiful gardens leading directly to the Promenade des Anglais with its 3 mile long beach. The apartment is set reached by lift taking you directly to the apartment located on the 3rd floor. There are 3 large double double glazed windows but passing pedestrian sounds may occasionally enter the double glazing to disturb the slumber of early/light sleepers, and if so, you are advised to avoid the Old Town as human noise is an integral feature. For the average person, the noise is almost inaudible and not a significant factor as the pedestrian square faces the windows of the apartment. The separate double bedroom contains a Queen size bed and leads to the balcony through double glazed French doors. The balcony holds a table and two chairs if you like the option of sitting out to look over the square in the morning or late evening where the ebb and flow of people keeps you entertained for hours. The bedroom has bedroom chairs, a large double wardrobe, bedside lamps and tables with parquet flooring throughout. The shower/toilet room is fully tiled, containing a heated towel rail, ceramic hand wash basins, wall mirrors, LED lighting and hair dryers and bidet. The shower room is spacious and well ventilated with an extractor fan and high ceilings. The apartment is designed to allow for natural ventilation by simply opening windows to allow air flow in from the sea and out through the bedroom towards the mountains. You also have the option of an automatic air conditioning system is set to keep Summer temperatures at a steady 25°C and will keep air humidity to within comfortable levels (especially in late August). The kitchen offers a washing machine, microwave oven, electric hob, a tall fridge/freezer, cupboard space for pots, pans, cutlery, toaster and electric kettle. The furnishings were never purchased for filling a 'holiday flat', so each item has been carefully selected to complete a harmonious whole where you can feel relaxed and comfortable whether it be a visit for a Winter sun break or a High Season visit where you have walked your feet off. The photos are accurate, so if you like what you see, then that is what you will get on your arrival. There is internet/wifi, English DVD library and TV. The floor is parquet and the building is very quiet. When you step out of the door of the building, you are in the centre of the historic, and vibrant Nice where everything is within walking distance - or where the silent tram passes through the square, and where the 98 Airport bus stops just 50 yards before Place Massena square. Some of the best shopping in Europe is located in Nice, from high street (Zara or H&M) to designer (D&C or Calvin Kline); walk 20 minutes along the seafront to the Old Port of Nice with its display of the rich and famous yachts mingled with quaint & highly coloured little fishing boats. Place Massena with its vibrant yet chic atmosphere is the centre piece of Nice. Our apartment has all mod cons right in the centre of Nice, yet offers a quiet and private escape from it all. Whether its a night on the town a romantic meal out experiencing the best of Nice cuisine, or a quiet relaxing night in you desire our apartment can accommodate. Our apartment is walking distance to public transport, regular and specialist shopping, sights, Old Nice theaters and the beach. Soak up the Cote d'Azur sunshine or participate in the numerous activities on offer including running, roller blading or cycling, diving, sailing, water skiing and jet-skiing. The Old Town has hundreds of alleys yearning to be explored, The shopping is exceptional, from high street to designer its a shopaholics dream. Nice Port offers a chance to observe the jet set lifestyle over a cappuccino or you can take a boat trip from Nice up the coast to St.Tropez and Cannes or you can explore the numerous little islands. Place Massena is the new cosmopolitan center of Nice, vibrant and luxurious. Nice also has many art museums, exhibitions and theatres to feed the senses. A short bus trip gets you to Monaco, or to the many hidden historical hillside villages or take off to the slopes of Isola 2000 ski slopes. You really can't find a better location in Nice to access all this City has to offer. Nice Center with the best shopping and restaurants just round the corner. Just over the street is the old town with it's alley ways, galleries and shops. Place Massena is across the public gardens. The beach is less than 100 yards away. The silent Tramway passes the apartment building and will soon be extended to take you to and from the Airport. The nearest cafe is literally across the street. The bus stop to the Airport is just round the corner. Our guests can have the confidence of enjoying the apartment when they stay because it is furnished for the owner and his family. Nice is the 5th French cities in terms of population after Paris, Marseille, Lyon and Toulouse. It is the centre of a urban area called Nice Côte d’Azur that gathers 24 towns and more than 500,000 inhabitants. Nice’s history is marked by two major features. First of all, Nice is a border town that was governed by many different persons throughout its history. The town was successively Provencal, Italian and French. Secondly, Nice expanded a lot during the 20th century thanks to tourism. These special features led to important social, political, economical and cultural consequences. The town planning also changed a lot as a consequence of this evolution. As said before, Nice is the historical capital city of the County of Nice. The city also belonged to the Maison de Savoie(European Dynasty during the Middle Ages) and to the Royaume de Piémont-Sardaigne (Sardinia’s Kingdom) before becoming French in1860. Every year, Nice welcomes more than 4 million of tourists, including business tourism. There are indeed two convention centres and several business quarters. The assets of this worldwide renowned city are important: a sunny weather, strategic location, active business centre, great beaches and coast, many interesting museums, an airport (the 3rd of France), a national theatre, an opera, concert halls, a national conservatoire, university, etc. Nice is the largest city of the French Riviera. Its territory spreads from Hyères and Menton. The valley of Var (west) and mountain of Boron (east) mark the boundary of the city. Situated between the Mediterranean Sea and the Alps, Nice has a perfect setting for holidays. It is a great place to go to for those who are eager to discover the French art de vivre of southern France. The stunning city of Nice is the fifth most populous city in France and the second largest French city on the Mediterranean coast. Nice is home to roughly 343,700 residents, although the urban area extends well beyond the city limits – pushing the total population up to around 1 million. The city is known as Nissa la Bella among locals – which translates to ‘Nice the Beautiful’ in English. With a name such as this, it should come as no surprise that the city has a reputation for glamour. Its warm climate and relaxed nature have attracted many rich and famous people over the years, including everyone from Elton John – who owns a villa in the area – to Queen Victoria of England, who spent many winters in the city. Two of the most attractive features of Nice are undoubtedly its climate and beach – both of which attract thousands of tourists each year during the hot summer months. These two things will no doubt be influencing factors for anyone who decides to relocate here, but they are by no means the only attractions you can enjoy here. Nice boasts a rich history, wonderful cuisine and a vibrant culture as well. Spend some time wandering the Promenade des Anglais, the main waterfront street which curves almost five miles around the beautiful Bay of Angels. The Promenade is home to a number of restaurants, hotels and historic buildings, and is well worth a visit! In Nice three emblematic places are named Masséna: a square, a senior high school and a museum. Here we have the story of the edification of Place Masséna. The building started in 1820. That was the beginning of a period when the heart of the town kept developing and adapting to the local landscape. Today Place Masséna is one of Nice gems. Let’s see what is known of its origins. Strategically located close to the Promenade des Anglais, it is the link between “the old city” and the town centre. Throughout the past two centuries, it was often reshuffled and reorganized. In the early nineteenth century, Nice was part of the Piémont-Sardinia kingdom. In 1824, the Consiglio d’Ornato, the royal town planning council, decided that the local authorities should plan the modernization and embellishment of the site. In 1832, Sardinia king passed architect Jean Antoine Scoffier’s project which proposed to go over the edges of the ancient walls bordering the Paillon River in order to extend the town. In the city plan, rather sketchy, relative to the right bank of the Paillon River, a symmetrical semi-circular area was scheduled. Its radius was fifty metres long and its centre was the intersection of the Pont Neuf and its north street façades. A church was scheduled in the background. Due to the technical problems raised by the semi-circular shape, the Consiglio d’Ornato launched a competition. Architect Jean Vernier’s project was taken on. It proposed a square site and a church at the back. In 1837, a flood turned the site into a swamp putting a stop to the implementation of the square. By then, Jean Vernier became Nice official architect. He started building the streets on the northern side of the square like the “rue du Faubourg”. Fit, old, living, hoping, laughing, crying, thinking, relaxing, working - just like everyone else. Great views, next to beach, restaurants all around, airport 3 miles - why not? 'Unique' is a word to be used sparingly. This apartment view is, however, 'Unique'. Large Bathroom contains shower, water flush toilet, heated towel rail, bidet, enamel hand wash basin, vanity unit. Place Massena is 70 yards from the beach on the Promenade des Anglais. Full air-conditioning throughout the house. Two washing machines - one ot these is a washer/dryer. There is a washer/dryer plus drying rails. Public car park under Place Massena and in the Nice Old Town just seconds/minutes from our property. Located on the mezzanine floor of the building. Two sitting rooms, each with sofas and chairs for the full number of guests. Two microwave ovens plus an electric conventional oven. French coffee press x 2. Full sets of plates, cups, cutlery pots and pans. Two TVs located in the sitting rooms. We hope we are providing you with a fabulous home in Nice. This flat is located in the best of both worlds being in the Old Town, next to the beach and being next to the Carré d’Or which is the upscale quarter of Nice both areas being true local neighbourhoods. You are overlooking the famous garden square in Nice's Place Massena and next to the pedestrian shopping avenue of Ave Jean Medicin with the Old Town directly behind the apartment building. You will not be disappointed with the location of this flat. All the stores you will need are within 5 minute walk. The building forms part of the red 18th century arch way buildings of Place Massena and is quite luxuriously positioned. It has great security and is kept very clean. The apartment itself is very comfortable, quiet and very easy to live in- guests have lived here for 40 days and say it was easy to do so. The apartment is located 20 yards from the Promenade des Anglais and its 3 mile long beach. This is a pebble beach with dry pebbles ready for drying you out after a warm swim and shower under the public showers. You may hire a sun lounge at one of the private restaurant beach front areas where you can stay for the whole day. Coco beach is also walkable just beyond the Old Port of Nice where many of the local French prefer to spend their beach days. There are many restaurants along Coco beach. Travel to our apartment from Nice International Airport Cote d'Azur is where most guests arrive from the modern 2-terminal airport where your holidays in Nice begin at this the 2nd largest airport in France offering a wide range of flights from all over Europe, USA and many other long haul destinations. Airport for carrier information can be obtained on line. Our holiday apartment is a short walk to the beach where the Airport bus (number 98) passes every 20 minutes from Nice International costing 6.00 euro/person. The excellent transport infrastructure in Nice provides Bus travel taking you all over the Cote d'Azur, and beyond - clean, comfortable and at 1.50 euros/per trip, it is relatively cheap where, for example, you get to Monaco in 25 minutes along a beautiful blue coast line. You can easily travel by the high speed TGV train from Paris to Nice , via Marseilles and has links into much of Europe including Spain & Italy with the Nice train station being just a 10 minute walk from our holiday apartment, or simply take the Nice Tram just seconds away from our holiday property and two stops from the train station. The Nice tram services traverses the North and South West of Nice. The tram is silent and may be picked up yards from our Holiday Rental Apartment every 7 minutes at a cost of 1.50 euros. A new link is under construction from Nice to the Airport where the cost will be the same as the bus. Arriving by private or car rental, on the roads to Nice, you can reach our Nice Vacation Holiday Rental apartment via the A8 motorway, taking exit No.50 "Promenade des Anglais. Follow this straight run along our beautiful beach front towards central Nice, you turn off to Place Massena. Car Parking exists throughout Nice. Our holiday accommodation is very close to many public car parking facilities and car rental hire companies in Nice and parking information to all of those arriving by car. Public parking costs around 90euros/week. However, some car Hire companies offer free parking. Arrival by sea is possible from Nice Port which is just 1.0 km from our vacation apartment. So you are close to ferry transport where numerous ferries leave Nice port for daily trips to St.Tropez or further afield in Corsica. Location Information: Our apartment is walking distance to all cosmopolitan Nice has to offer. The Promenade and the beach give you a chance to either sit in style soaking up the Cote d'Azur sunshine or participate in the numerous activities on offer including running, roller blading or cycling the promenade, diving, sailing, surfing, water skiing and jet-skiing. The Old Town has hundreds of alleys yearning to be explored, full of character and history. The shopping is exceptional, from high street to designer its a shopaholics dream. Nice Port offers a chance to observe the jet set lifestyle over a cappuccino or you can take a boat trip from Nice down the coast to St Tropez and Cannes or you can explore the numerous little islands. Place Massena is the new cosmopolitan centre of Nice, vibrant and friendly. Nice also has many art museums, exhibitions and theatres to feed the senses. A short bus trip gives you Monaco, Cannes and St Tropez, many hidden historical hillside villages and the ski slopes at Isola. Other Activities: Shopping, Art and Culture, Antiques, Eating, Drinking, Promenading, Relaxing, Wine Tasting, Homes of the Rich and Famous, Yachts, Boat Trips, Sun Ski: The French Riviera is not only famous for its coastline, the nearby mountain villages and ski resorts are very popular. Why Ski Nice ? Skiing in Nice France Not only can you stay in our luxury apartment and take advantage of the winter sun of all this all year Mediterranean coastal micro climate. Further Details: Location Information: Our apartment is walking distance to all cosmopolitan Nice has to offer. The Promenade and the beach give you a chance to either sit in style soaking up the Cote d'Azur sunshine or participate in the numerous activities on offer including running, roller blading or cycling the promenade, diving, sailing, surfing, water skiing and jet-skiing. The Old Town has hundreds of alleys yearning to be explored, full of character and history. The shopping is exceptional, from high street to designer its a shopaholics dream. Nice Port offers a chance to observe the jet set lifestyle over a cappuccino or you can take a boat trip from Nice down the coast to St Tropez and Cannes or you can explore the numerous little islands. Place Massena is the new cosmopolitan centre of Nice, vibrant and friendly. Nice also has many art museums, exhibitions and theatres to feed the senses. A short bus trip gives you Monaco, Cannes and St Tropez, many hidden historical hillside villages and the ski slopes at Isola. Other Activities: Shopping, Art and Culture, Antiques, Eating, Drinking, Promenading, Relaxing, Wine Tasting, Homes of the Rich and Famous, Yachts, Boat Trips, Sun Ski: The French Riviera is not only famous for its coastline, the nearby mountain villages and ski resorts are very popular. Why Ski Nice ? Skiing in Nice France Not only can you stay in our luxury apartment and take advantage of the winter sun of all this all year Mediterranean coastal micro climate. The nearby ski resorts offer Guaranteed sunshine, snow and mountain peaks reaching 3000 meters in altitude and all can be done in a day trip from Nice. There is a great mix of beginner, intermediate, and advances routes on and off piste and of course some of the very best ski schools for adults and children alike. Family ski and beach holiday in Nice france Ski Nice France How do I get to the piste ? Ski Bus leaves daily from the Apartment strait to the Pistes!